The idea for P6 came about after my daughter and I purchased a very interesting and curious jewelry type box at an art fundraiser sale. The box had little drawers in front and was decorated and ornamented in a Dia de los Muertos style. In one of the drawers there was a little note that said,” secret drawer in back.” As I was trying to come up with ideas for the final project, my thoughts kept going back to the box, so I decided to create a story and make a film about it. I did not want to do a narration or anything; I thought of a girl finding messages in the drawers of the box and acting them out would be more interesting. I shot the video using the Canon Elph 320hs again and edited the footage in iMovie. One happy accident occurred when the memory card ran out. This happened when we were filming the shots by the river and my friend Greg that was with us just happened to have a Fuji waterproof camera with him. As we were leaving, I asked him if we could use it for an underwater shot and he came up with the idea of filming the girl looking at her reflection in the water. It’s funny how things happen sometimes. What I was trying to accomplish with this project was to make an interesting work that people would really enjoy and like to see again. I would not have been able to do this project without my daughter. She really got into doing it and inspired me throughout the process. This entry was posted in Sp15-P6 Final Project on June 3, 2015 by Philip Malfa. My original idea for this project was to ask one question to five different artist/musicians and video tape their response along with added images and footage of their work. I still like the idea and might use it for the final project but i didn’t think it was feasible at this time to work with five different schedules so i relegated the idea. I came up with another concept of having five different dances done by one performer. I pitched the idea to the class and it seemed like the way to go. I had to work with another person’s schedule and didn’t start shooting until two days before the project was due. We created some sets out of whatever we had and I waited in between costume changes to start shooting different scenes. It was a lot of waiting, but I feel it was well worth it. My theme was to pay homage to the silent film era of the 1920s and 1930s as well as the Nickelodeon era where people put a nickel into a Kinetoscope machine to watch a brief segment of a moving picture. I used a tiny Canon Elph 320Hs in B&W mode for the video. This was also my first time using imovie or editing film for that matter so I was learning as I was working. I purposely avoided making precise edits. I wanted the editing to be choppy and rough, not fancy and smooth. I really enjoyed working with video and I know I will be making more videos. go to my youtube video which is https://www.youtube.com/watch?v=1KwPYh9J3J4 Due to post link having issues. 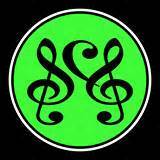 Thaddeus Moore is the original founder and chief audio engineer of Sprout City Studios located right here in Eugene, Oregon. He has been involved in the recordings of over 650 albums since 1997 when the studio first began. He has worked with some reknown artist such as Frank Black, Keb’ Mo’, and Thomas Mapfuma. Thaddeus also teaches The Fundamentals of Sound Engineering Class through the Continuing Education Program of Lane Community College. Originally, I was hoping to meet with Thaddeus in person but he was fighting a nasty bug at the time and didn’t want to get me sick. However, he had no problem doing a Q&A interview with me via email even though he wasn’t feeling well. After I sent him some questions, it was no more then an hour that I received an email back. This confirmed my thoughts on how much of a courteous and thoughtful guy he is. My main interests and fascination have always been with sound and audio engineering, so I am grateful to have had the opportunity to ask questions about audio engineering to someone I respect and aspire to emulate. Shortly after Sprout City opened in 97,’ my friends and I recorded there. I remember how cool the vibe was — and the tracking room where we jammed in was a place you never wanted to leave. 1) What advice do you have for someone who would like to become an audio engineer and find a job in this field ? DO NOT build a studio. Get involved in a healthy studio environment that already exists. Build a community. The numbers just aren’t there for a new engineer unless you are 1. Stubborn/Stupid (like me) and luck your way into success, or 2. LOADED with burnable money (unlike me). 2) Since more and more musicians have access to digital recording tools these days and are making their own recordings at home, how has this affected the recording business? Its like plumbing. Really! You can totally Plumb your own house, but if you pay a pro, they will get it done really fast and probably better than you could have done yourself. However, if one is willing to put in the time to learn, ANYONE can get involved. It’s a super fertile level playing field. 3) What does the future look like for the audio engineer? 4) What’s the best part of your job? 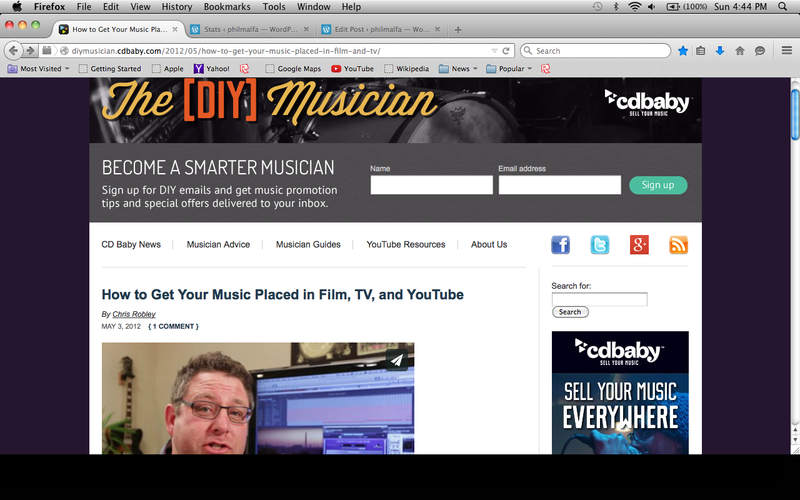 Helping artists see their music in a new way. Finding new tricks to get around all the problems of capturing the emotion of a live performance. Learning every day to get more and more out of the way so that it just happens as it should. Sorry, that’s a lot, I guess simple answer is – Everything. This entry was posted in Uncategorized on May 20, 2015 by Philip Malfa. This entry was posted in Uncategorized on May 19, 2015 by Philip Malfa. This entry was posted in Sp15-P5 Image Editing on May 18, 2015 by Philip Malfa. 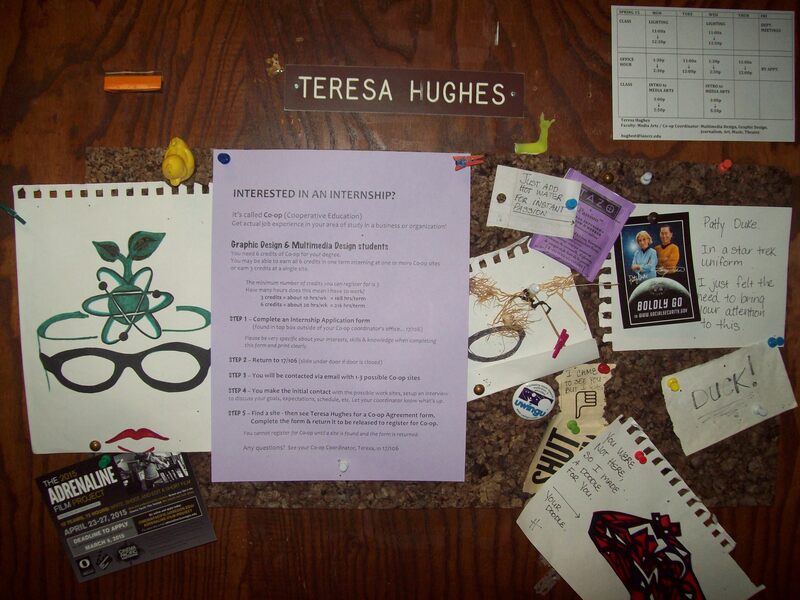 Teresa’s fun creative office door. 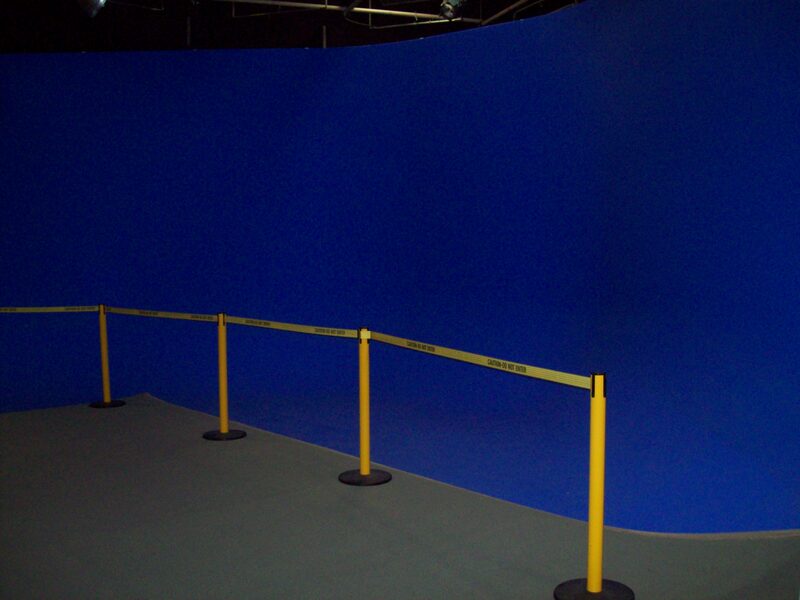 “Blue Cyc Wall” in building 17. 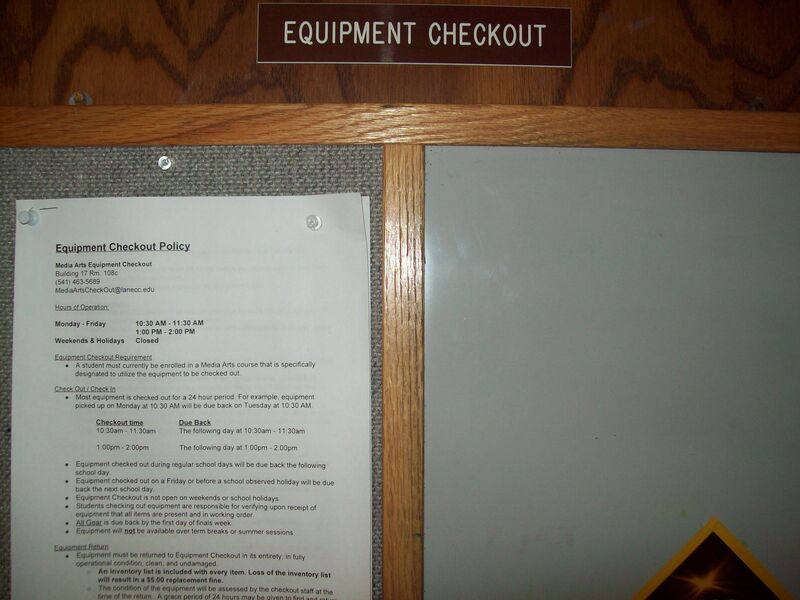 Door of the Equipment checkout counter for Media Arts students to checkout killer gear for their projects. 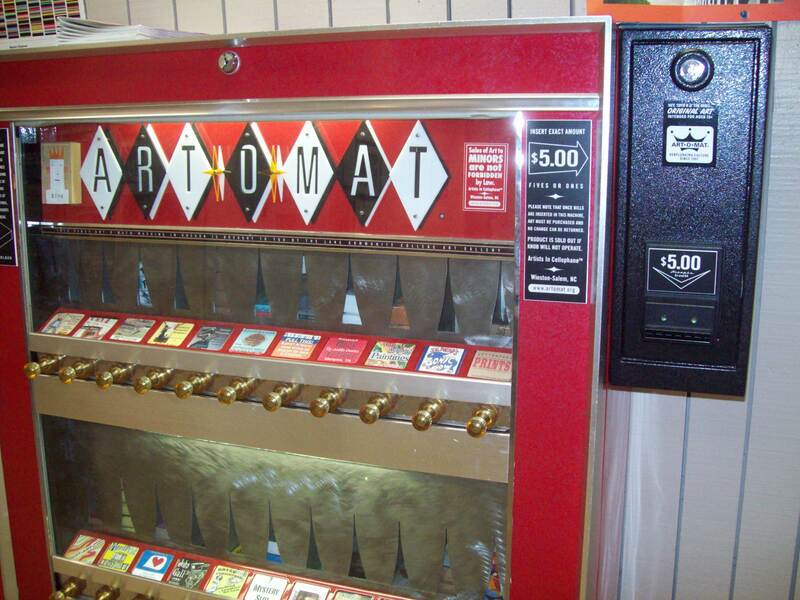 The Art-O-Mat. A vintage cigarette machine converted to an art vending machine. Library Reference Desk. 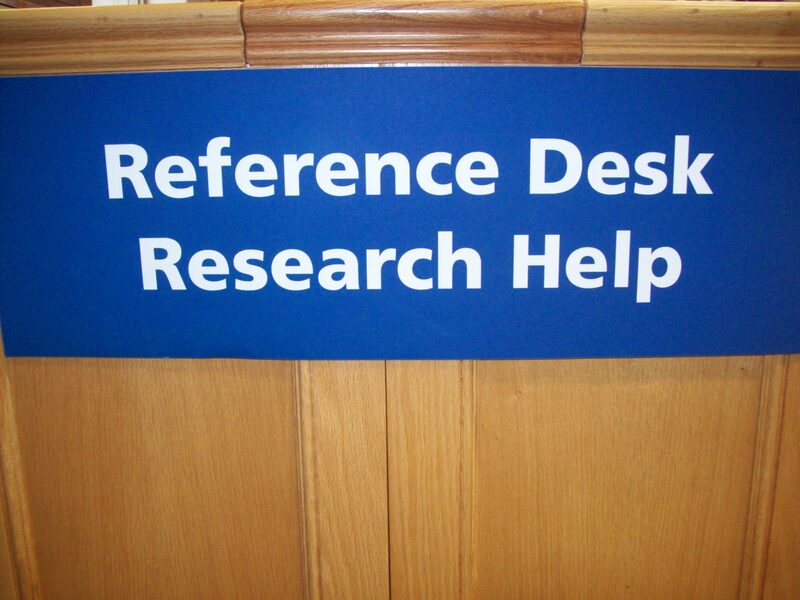 Look for this sign when you need assistance in the library. 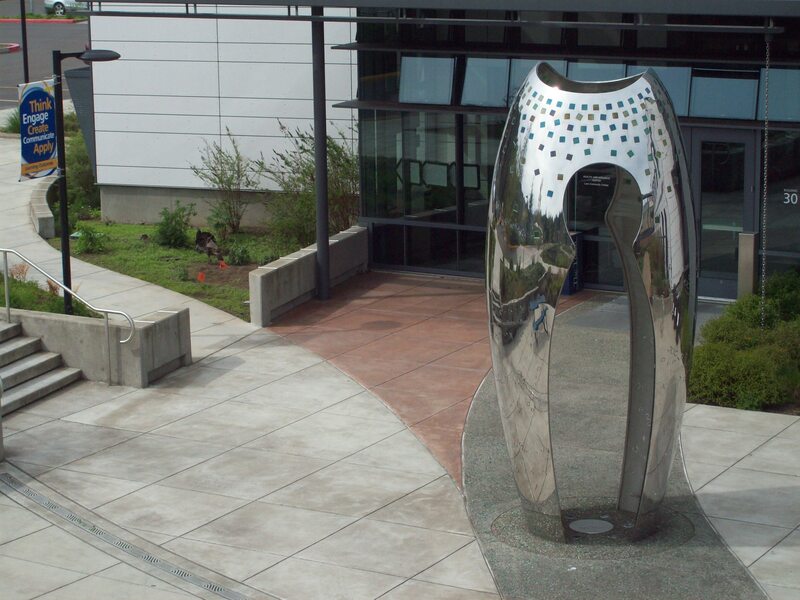 The silver in the round sculpture that you can walk through outside the Health and Wellness Building. 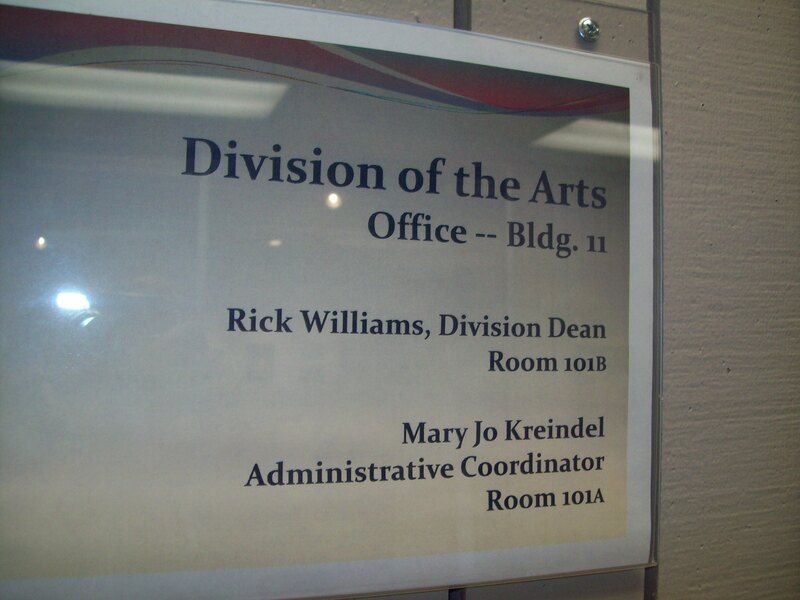 Mary Jo Kriendel’s office (The Arts division Office Specialist) in the Arts Building. 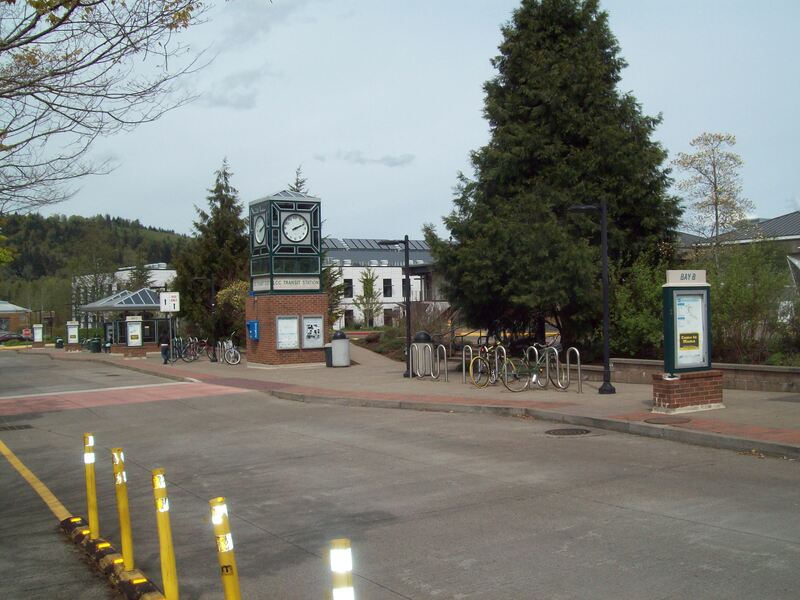 The Bus Stop on campus. 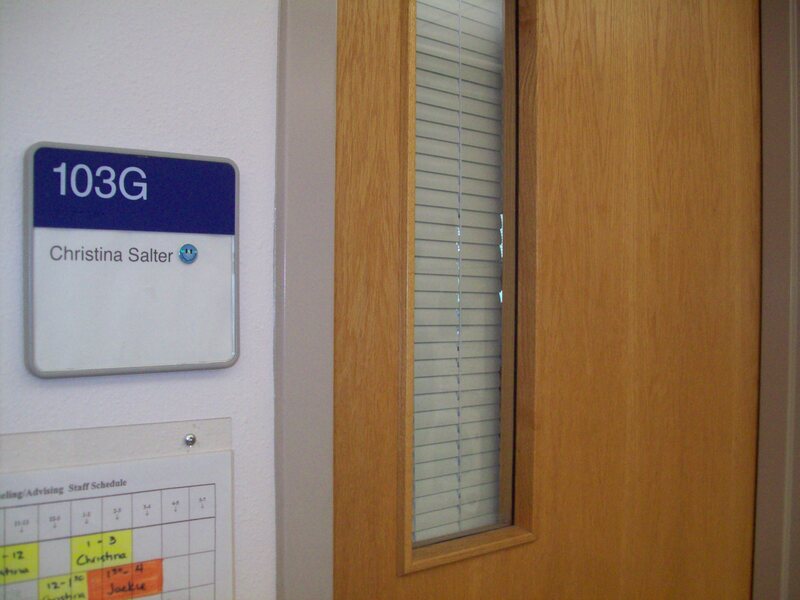 Christina Salter’s (Media Arts Adviser) office inside the Students First Building. 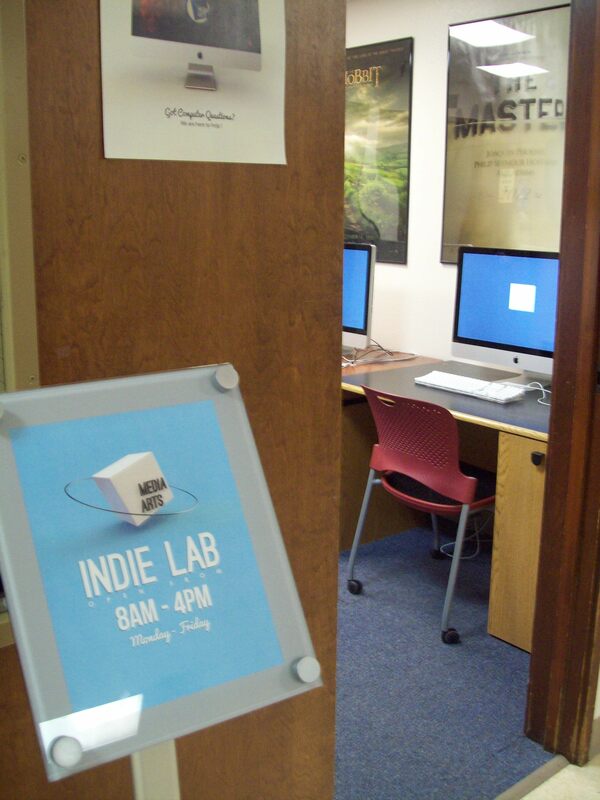 The Indy Lab on the 2nd floor of building 17. 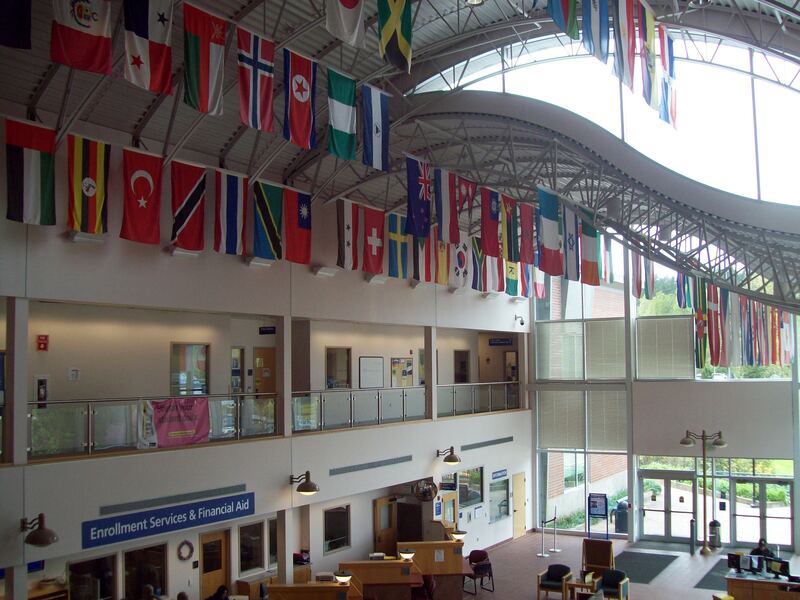 The unfurled flags inside The Students First Building. 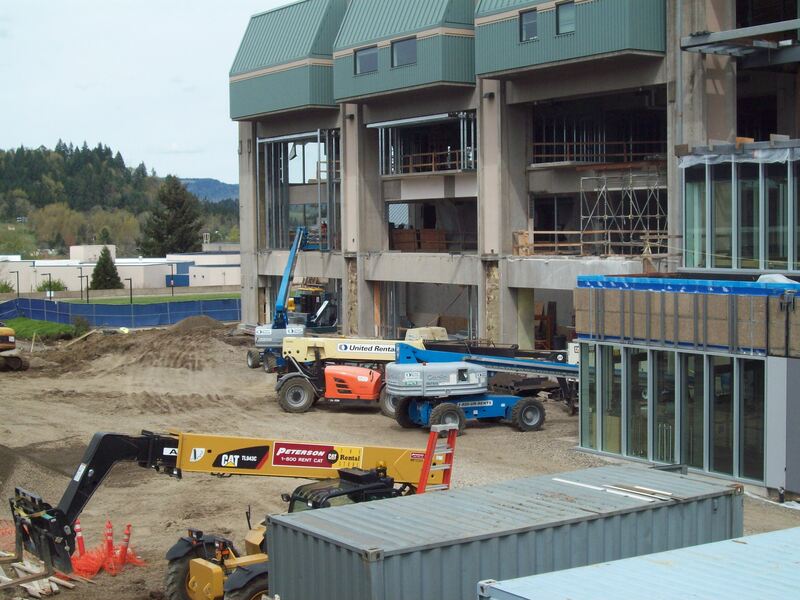 Construction and transformation of the Center Building. This entry was posted in Sp15-P2 Scavenger Hunt on April 15, 2015 by Philip Malfa. I am not one who’s really fond of writing about myself, but here are a few things about me. 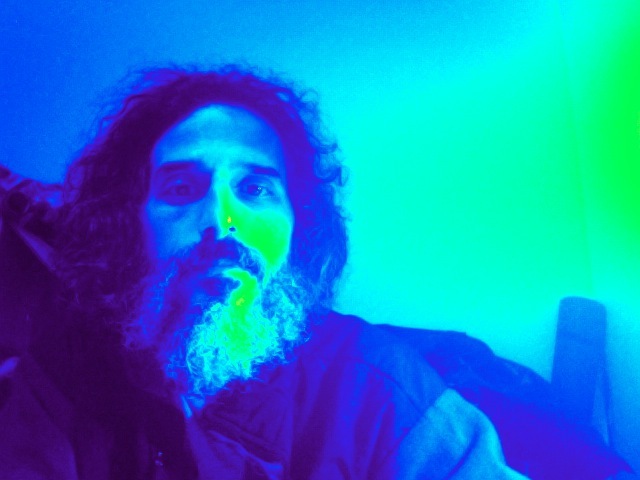 My name is Phil, and I’ve lived in Eugene, Oregon for over two decades. I was born and raised in the Bronx and after High School moved to the west coast to Southern California where my two older sisters and other relatives lived. I’ve been in the Northwest longer than any other place and consider it at this point my home. I am going on my eigth year of working at Lane Community College for a program called Specialized Support Services that supports people with alternate abilities in vocational settings here at the main campus, the downtown center, and in the community. I have been taking classes at Lane part-time and hope to receive a one-year certificate in Multimedia Design. 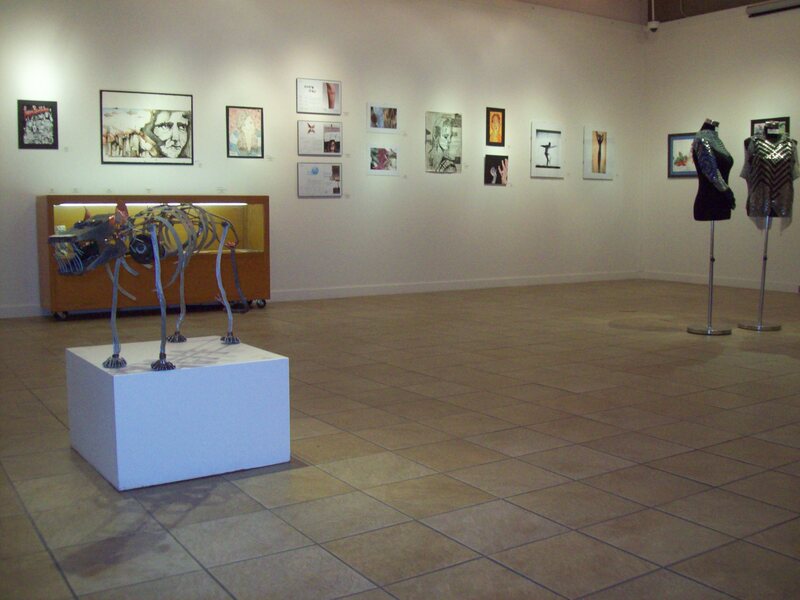 I am drawn to more of the sound and visual aspects of the program and would love to find a job that incorporates both. My dream job would be making sound tracks for movies and someday, I even hope to make a documentary or short film. I’m a returning college student–a lot older now–so, things are a bit more challenging but the teachers here at Lane have just been fantastic, and I am very grateful to have this experience in my life. When I have free time I like playing and recording improvisational music with my friends. I am also a part-time dad and enjoy spending time with my wonderful daughter. This entry was posted in Uncategorized on April 7, 2015 by Philip Malfa.